SUBHEAD: How many trees do I need to plant in the coming year to offset the climate impact of my lifestyle? 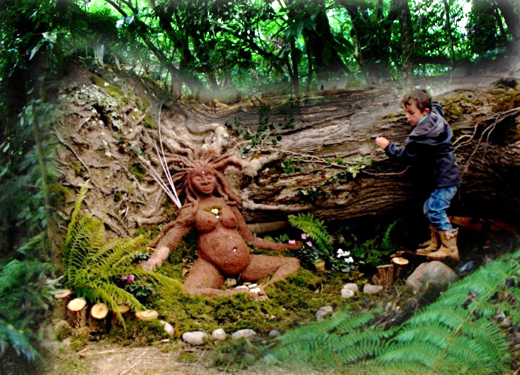 Image above: A child finding magic in the forest. From original article. When I was a young boy my parents moved from the Chicago suburbs to a hardwood forested area of Connecticut, which is where I grew up. My back yard was those woods, and I used to have play forts, many different camping or hiding areas, and a succession of tree houses. I liked to overnight on a mattress of pine needles in a small grove of pines, and sometimes even did that in a foot of fresh, powdered snow. My parents also let me climb trees and play on an old rug covering scrap timber I had placed across the lower boughs of a large post oak. Later I built a round pole tipi in that tree and spent many summer nights living there, learning to climb up and down with ropes. I guess you could say trees are as family to me. They remain a part of my life wherever I go. When I was 17 I learned to work horses on the long line, and later, when I arrived at the Farm in Tennessee, fresh out of grad school, I put those skills to use snaking logs from the forest with a team of Belgian mares. I built a tent home for my bride on a platform of hand hewn oak logs acquired that way. People would sometimes come to the Ecovillage Training Center at The Farm and marvel at the small-diameter round poles used for rafters on the very large living roof spanning our Green Dragon tavern, but I knew when I built that roof that round poles were much stronger than milled lumber. They were like the tree limbs that had supported my tree houses. In my thirties I was a pubic interest attorney fighting against a chemical company in a town 15 miles from The Farm. The company was manufacturing organophosphate pesticides and herbicides and injecting its waste products, including its bad batches, into a deep well. The State Water Quality labs had tested the green luminescent effluent and said it was the most toxic they’d ever encountered. A single drop dripped into their fish tank killed all the fish within 24 hours. That deep well went nearly a mile down and pressure fractured bedded limestone — it “fracked” it — to make the rock more receptive to millions of gallons of this witches’ brew. The fracturing also opened pathways into the Knox Aquifer, one of the largest underground rivers in North America, and presumedly went on to contaminate other large, potentially important, fresh water reserves for the Southeastern United States over a very large area. Each test well the company drilled showed that the contamination had already traveled farther away from the site than the company was willing to track. The State did not have the resources to drill million-dollar test wells, so the full extent of the damage may never be known. As well water in the area gradually turned fluorescent green, the company bought out the landowners and sealed their wells. When our local environmental group sued the company, the company told the judge that there was no reason to protect the aquifer because the Southeast region had plenty of fresh water on or close to the surface. In written briefs, I made two arguments against that: population and climate change. Freshwater resources were valuable, and would only become more so. This was the early 1980s, and there I was, going into a Tennessee court and trying to make a case for global warming. It forced me to read nearly every study I could get my hands on and to contact experts and beg them to come and testify. I tried to simplify an extremely complex subject so that the average judge or juror could understand it, despite confusing and confounding webs of arcane psuedoscience spun by company lawyers, and exceptions in the federal Resource Conservation and Recovery Act that you could pump a lake through. As it turned out, the case never went to trial. The Tennessee Department of Health and Environment contacted me and persuaded me I should help them draft regulations banning deepwell injection and hydro-fracking, which I agreed to do. That was a much less costly route for the local environmental group, letting the State bear the expense of experts to fight off the well-funded and unscrupulous industrial lobby. We had won, although it took a few years before the victory was sealed and the chemical companies packed up and left town. Their toxic waste is still down there, for now. In any nonviolent campaign there are four basic steps: collection of the facts to determine whether injustices exist; negotiation; self purification; and direct action. — M.L. King, Letter from a Birmingham Jail (1963). In that time I had spent reading and speaking with experts I had scared myself. Global warming was a much bigger deal than I originally thought. We were up only a half-degree over the prior century at that point, but already there were signs the poles were melting, sea levels were rising, and more frequent droughts were coming to mid-continents. In 1988, the Mississippi River had gotten so low that barge traffic had to be suspended. My young congressman, Al Gore Jr., opened hearings on Capitol Hill. Scientists began going public to sound the alarm. Big Oil and Coal began funding campaigns to undermine the smear those scientists and to poison the public debate with bogus studies and conspiracy theories. The Bush Administration’s official policy was climate science censorship. All these signs were ominous. Fossil fuels have had such a profound change on civilization that it is difficult to imagine giving them up voluntarily. They issued in the industrial revolution and globalized the world with railroads and steamships. They ended a particularly odious practice that had been the traditional method of Empire-building for the previous 5000 years, supplanting the long tradition of human slaves with “energy slaves” and “energy-saving” home appliances. The American Civil War was a last gasp of plantation economics, and it ended with a crushing victory for steely industrialists and their fossil energy, who went on to extend their new empire with the Spanish American War and all the resource wars thereafter. Does the end of coal and oil mean a return to human slavery or can we learn to craft an egalitarian society within a solar budget? Time will tell. On the other side of the ledger, there are a few promising signs that something can be done to reverse the effects of three centuries of oil and coal addiction. The forests of North America remain a net carbon sink, but when land goes from forest to farm, it generates a huge spike in atmospheric carbon. In Mexico, which is losing more than 5000 km2 of forest every year, logging, fires and soil degradation account for 42% of the country’s estimated annual emissions of carbon. 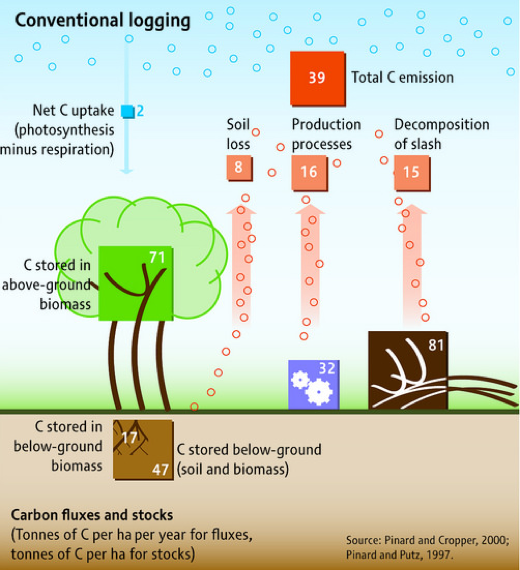 In addition to the carbon lost from trees, soils lose 25–31% of their initial carbon (to a depth of 1 m) when plowed, irrigated and cultivated. In the US, croplands increased from about 2500 km2 in 1700 to 2,360,000 km2 in 1990 (although nearly all of that occurred before 1920). Pastures expanded from 1000 km2 to 2,300,000 km2 over the same period. The fabled era of the cowboy was between 1850 and 1950, and the pattern was repeated in Canada and Mexico. But then something different happened. Partly because of the Dust Bowl and the organized responses of the Roosevelt Administration, partly because of the Great Depression, and partly because of an emerging conservation ethic, after 1920 many farmlands were abandoned in the northeast, southeast and north central regions and 100,000 km2 were reforested by nature. Between 1938 and 2002 the US gained 123 million acres of forest from farm abandonment while losing 150 million acres to logging, primarily in the Southeast and Pacific Northwest. This trend, net marginal loss, continues today in the US and Canada, in contrast to Mexico which is rapidly destroying its forests, and not re-growing them anywhere. The net sink effect of a recovering forest is variable but the average for Eastern deciduous successional forest it is 200 grams C per m2 per year, or two metric tons per hectare. This is calculated by considering annual growth and mortality above and below ground, the chemical changes in dead wood, and net changes in soil carbon. (Pacla S., et al., Eddy-covariance measurements now confirm estimates of carbon sinks from forest inventories, in King & Dilling, 2007). Sometime around 1985 I began planting trees to offset my personal carbon footprint. Today that forest is about 30 acres (12 ha) and annually plants itself. I wrote a book, Climate in Crisis, pulling together my legal research and laying the climate science out in lay terms that non-scientists, such as myself, could grasp. In 1995, I retired from law to become a permaculture teacher and ecovillage designer. I continued to attend scientific meetings and international negotiations on climate, and I contributed a blog, many magazine articles and books to the discussion. I kept myself current with the latest findings, always exploring pathways that might provide solutions, not just for my personal footprint, but also to the coming climate catastrophe for us all. As I wrote in Climate in Crisis, and later in other books, forests are scrub brushes. They absorb CO2 from the air, transform it to O2 with the magic of photosynthesis, and sequester the C in lignin and cellulose. They also transfer it deep into the ground through their roots and the soil food web. We, the humans, might be able, under optimal conditions, to get up to sequestering as much as 1 gigaton of carbon (petagram C or PgC) annually by switching to “carbon farming:” holistic management; compost teas; keyline; and organic no-till. Biochar’s full potential is estimated at 4 to 10 PgC per year, if the world were to widely employ biomass-to-energy pyrolysis reactors. Image above: Carbon cycle in undisturbed (or fully reforested) tropical forest. From original article. 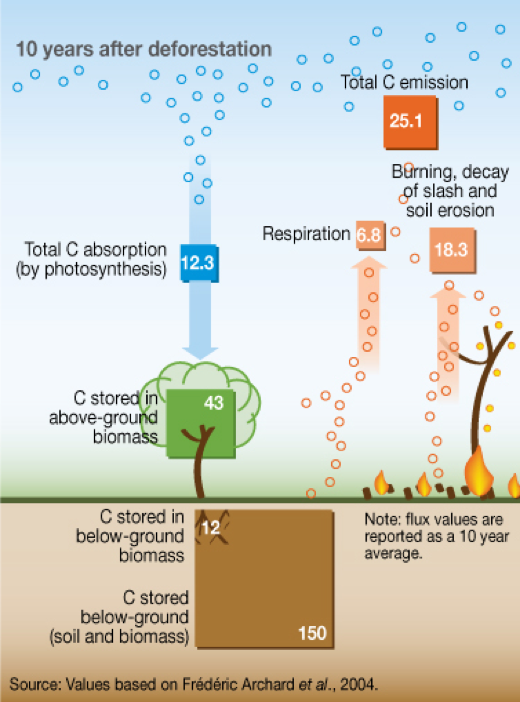 Image above: Carbon cycle after ten years in a deforested tropical forest. From original article. Forests, with all-out reforestation and afforestation, have a potential yield of 80 PgC/yr. The climate cycle, with 393 ppm C in the air [this was written in January 2013. The number now is 407], is currently adding 2 parts per million to the atmosphere annually. That represents an additional retention of 3.2 PgC over what Earth is able to flush back to the land or the oceans. The oceans are acidifying — at a disastrous pace — because of the excess C being flushed, so what needs to happen is that more C needs to be taken from both the oceans and the atmosphere and entombed in the land, which is, in point of fact, where the excess came from in the first place. To get back to 350 ppm — Bill McKibben’s goal — we need to lower atmospheric carbon by 42 ppm, or 67.4 PgC. If we wanted to accomplish that goal as quickly as say, 2050 (37 years from now), we would need to average a net C removal rate of 1.82 PgC/yr. So we need to go from plus 3.2 to minus 1.8, on average, over about 40 years. Of course, many, myself included, don’t believe 350 is good enough to pull our fat from the fire. I would prefer we aim for 320 ppm by 2050 if we want to escape the worst Mother Nature is now preparing to dish up. 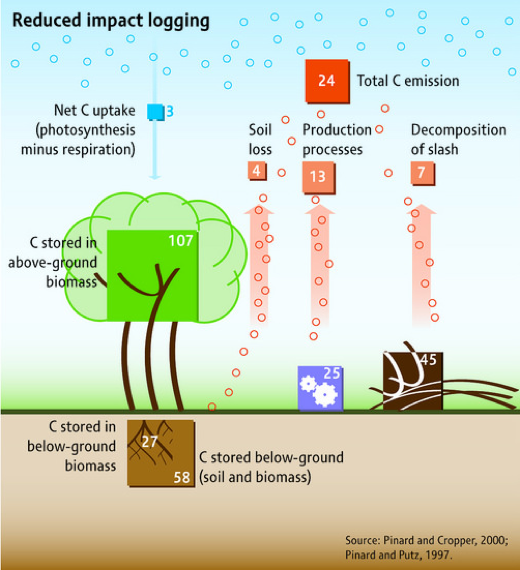 Image above: Carbon cycle in conventional logging in a forest. From original article. 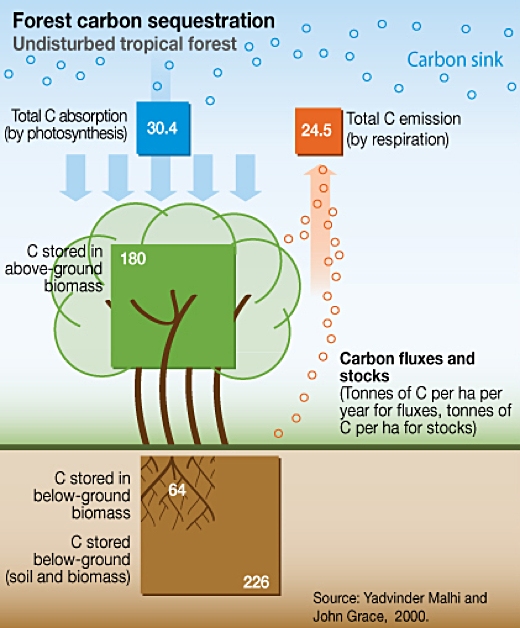 Image above: Carbon cycle with reduced impact logging in a forest. From original article. A 320 goal in 37 years means we need to lower atmospheric carbon by 72 ppm, or 115 PgC; an average a net C removal rate of 3.1 PgC/yr. In other words, we need to flip from adding 3.2 PgC greenhouse gas pollution every year to removing about that amount. We have to go net negative, for at least the next 40 years. Organic gardening and soil remineralization, as Vandana Shiva, Elaine Ingham, Dan Kittredge and others are so enthusiastic for, will not get us there, although it is a good start and an important wedge, with many other benefits. Biochar could get us there, but the industry is immature, poorly understood by environmentalists, and dependent on financing that may or may not be available in an era of de-growth and economic collapse. To scale up to 3 or 4 PgC/yr is likely to take longer than 40 years. Tree planting is our best bet. Franklin Roosevelt’s Civilian Conservation Corps planted massive shelterbelts to end the Dust Bowl, and the jobs provided helped lift the USA out of the Great Depression. The same could be done in Spain and Greece, not to mention Africa. And, lest we forget, two of the world’s greatest reforestitians, Christopher Columbus and Genghis Khan, demonstrated our species’ ability to rapidly change climate. They showed that we could even jump start a minor Ice Age if we wanted. Talk about air conditioning! Fageddaboutit. Right now, the planet is still rapidly losing forest. In 1988, borrowing from federal agency reports being suppressed from publication by the first Bush administration, I drew graphics to show what would happen to the Eastern forest in a 5 degree warmer world, and the kind of species migrations that might be expected. Image above: Migration towards the arctic of some North American forest trees with 5 degrees centigrade increase in temperature due to global warming. A more important point, which I raised in Climate in Crisis, was that individual forest patch compositions are less important than the synergies that are lost when those compositions are broken up. It matters what happens between patches, and it is not just about plants, either. We need to consider the pollinators and seed storing animals. They can’t just have food in one season, they need it in all seasons, or they will leave. Some plants and animals are fast migrators (armadillos and spruce) and some are much slower (leafcutter ants and ginkgo). When you force a rapid system change, the network of connections is broken, and it may take some time to find new equilibrium. In the meantime, biodiversity crashes and ecological services are impaired. The web unravels. Every year on New Years Day I write down my annual electric meter reading, chart the milage of whatever vehicles I used, including buses, trains and airplanes, and also quantify my use of propane gas, firewood, etc. Using a conversion formula from the book, I convert my personal energy slaves into tree-years. From that I determine how many trees I need to plant in the coming year to offset the climate impact of my lifestyle. Planting trees as a personal offset requires a bit of advance planning, because the calculation depends on how long a tree will grow, how big it will become, and what it will likely give back to the atmosphere at the end of its life. Also, one has to anticipate the changing dynamics ushered in by rapid climate change. This led me to arrange for a long-term contract of some land and to acquire new knowledge on how best to plant and manage a climate-resilient forest. I now have the benefit of visits to the Pioneer and Alford forests in the Ozarks, which I describe in The Biochar Solution (2010), as well as to wilderness old growth in Scotland, British Columbia, Northern Queensland in Australia, Muir Wood in California, the Darien Peninsula of Colombia, the Mesoamerican highlands and the Amazonian Basin, to name a few. I have studied permaculture, with special reference to the work of Christopher Nesbitt, David Jacke and Eric Toensmeier in designing a methodology for building food-resource forests. But, back in 1985, I had none of that, and so I began on a part of my parents’ farm that was in the process of transitioning from vegetable field production to low brush. AUTHOR'S Apologies to regular followers of our blog who may read the above when it was first published in 2013. We are re-running this two-part series this week and next while absorbed teaching a Permaculture course in Ireland.